We had a range from 1953 - 2016. Hard to think of AR models that we missing - no Touring Spiders. It was a great time. We took about 38 cars for four laps of the road course during the racing lunch break. A couple of additional photos. And the Youngest AONE Member, my little guy. He is enjoying a pretend ride at home after the races. Wish he could have joined us on the track, mom and dad got a little nervous about that one. Maybe next year! rogerspeed and spiderJohnNH like this. I enjoyed meeting your dad and Arlo is always fun to see. Thanks to Gene for organizing this event. great day at the races and a lot of beautiful cars. Good to meet you all! Thanks for posting the photos. 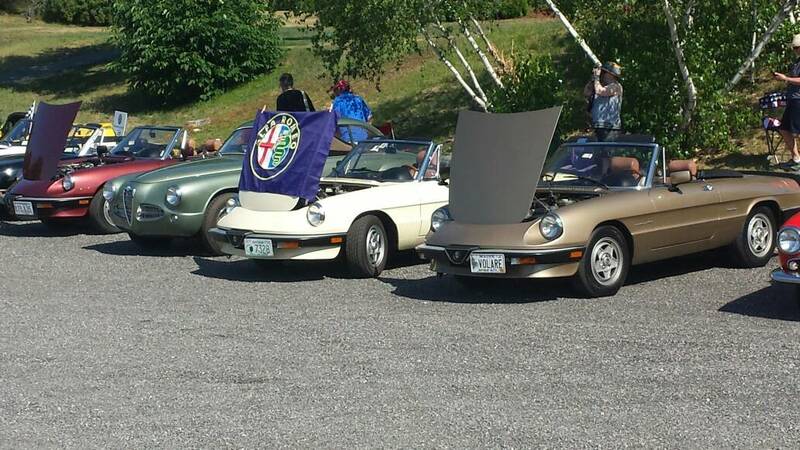 Yes, there was a great turnout with several interesting Alfas I'd not seen at other meets. Highlights for us were the parade laps and watching the 2 lead GTV's fighting it out during the Alfa feature race. we had another great day today. Not as many turned out as last year, but we still had a great time. Thanks for the update John. Sorry I missed it. The rain was just to heavy here in the morning. See you in Vermont. Wow- great turnout and great cars! I strolled around the corral after the first mini monsoon, so I guess I missed quite a bit. after the second monsoon it turned out to be a nice day. Hey JT - I had a nice chat with your dad. Here is a picture I snapped of your car. It is very nice. Are you going to race at the Convention in Montreal? Hi John- Thanks for posting. Unfortunately, I can't make it to Montreal. I was really hoping to get there, but the timing isn't right. Sorry to miss this and the cars and coffee at Glynn Motorsports. He had my 1750 motor which I now have back in my possession and will be completing in the next month. Sadly a winter project that crept into summer. I'm marking off AONE dates for wings and wheels and the Tutto shows. Hope to be back on the road by then.